Get ready to be healed. Pioneers in Authentic ayurveda and Yoga since 1908. the centre is run by a family of ayurveda physicians with a tradition spanning centuries. Voted Best Ayurveda Centre thrice Kerala, India for its exceptional quality in treatment and medicine. Trusted by millions of people to bring back smile for the aching mind and body since 1908. Welcome to Chingoli Ayurveda Hospital, rated one of the best ayurveda hospital in India with a tradition since 1908. Dr. Suresh Babu , Dr. Mohan Babu and Dr. Sandeep are the chief Physicians at Chingoli ayurveda hospital, who are the descendants of Chingoli ayurveda family of physicians which hails from 19th century. The centre is run by the famous chingoli ayurveda family whose physicians are a repository of rich wisdom in ayurveda accumulated over 4 generations. Effective Ayurvedic treatment for back pain, asthma, diabetes, piles, weight loss, infertility, obesity, pimples, rheumatoid arthritis, PCOS , sinusitis, hair regrowth, knee pain, dandruff, paralysis, migraine, hair loss, hair fall, skin diseases, fibroids, knee joint pain, constipation, acidity, osteoarthritis, cholesterol, jaundice, sciatica, osteoporosis, haemorrhoids, gastric problems, spondylitis, cough, insomnia, psoriasis. My wife and I have been enjoying our therapy every year for more than a decade at Krishnendu Ayurveda Hospital. My rheumatoid arthritis ESR used to be ’56’ when I started therapy, and now for the past four years my ESR has been ‘4’. Through therapy, my wife has significantly experienced a decrease in her back pain. While we thank you and your staff for the wonderful job you are doing, we praise God for providing Krishnendu Ayurveda Hospital. Services of your associate doctors and therapy technicians are very commendable. God bless you all. My wife and I had a very good time of relaxation and therapy at your facility. The room was very good and the grounds were very pleasant. Our ten day stay was highlighted by the wonderful oil massage and treatment. We appreciate your staff who made such a stay so good. Wir danken für die excellente Betreuung während unseres Aufenthaltes in der Krishnendu-Klinik. Für jemanden, der sich ernsthaft mit Ayurveda beschäftigen möchte und der auf beste medizinische Betreuung und herrliche Massagen, aber auch auf einen nachhaltigen Kureffekt Wert legt, kann Ihre Klinik nur bestens empfohlen werden. Wir waren von der professionellen Organisation und dem Verfliegen unserer vier Behandlungswochen sehr angetan und auch die Nachwirkungen auf unser Wohlbefinden halten noch an. I would like to extend my sincere gratitude for your treatment and care that you have provided during my stay at Krishnendu. I recommended Krishnendu to many people not because I was there but because of the service you and your staff provided. You have done an excellent job to maintain everything in your facility. The staff is absolutely amazing and I just don’t know how to put it in words. Your care alone can make a person get cured. Thank you so much Doctor! Me and my husband felt the dire need to unwind and relax after our eventful world tour and we managed to do just the same by squeezing in a quick trip to Kerala before we go back to the hustle and bustle of life. We had planned to visit Krishnendu Ayurveda after coming across excellent reviews and suggestions online. Upon our arrival a consultation with Dr. Mohan Babu was organized and he suggested we both undergo Panchakarma treatment for effective detoxification. Having indulged in a trip of fun and frolic and having relished various international cuisines, we couldn’t agree more to his valuable suggestion for restoring the balance in our bodies. We dived into the 7 day treatment and let ourselves experience sheer bliss. Having put on weight from our carefree rendezvous abroad, my husband cherished the Panchakarma and detox procedures as Dr. Mohan had described that the treatment module we were undergoing will effectively flush out toxins and promotes weight loss. It’s hard to describe in words how soothing and relaxing the traditional ayurvedic massages are and being performed by the expert masseurs there, it was an absolute delight to experience the Vasti or medicated enema and Nasyam the sinus cleansing treatment.The detox procedures were monitored by Dr. Sandeep and to give us an immersive experience he even took time to explain in detail how the procedures will affect the body. The staff is also ever ready to offer their assistance and it was comforting to have someone look after you with suchcare and affection. All of this wondrous experience will not have been complete without the presence of a serene and healing ambience. Located amidst lush greenery, the facility is designed to be an ideal place for rejuvenating both the mind and body. 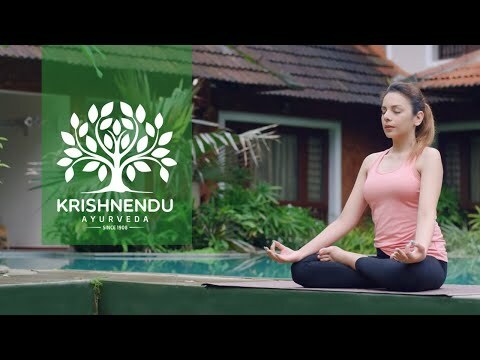 Our experience with Krishnendu Ayurveda has been by far the best de-stressing one we had enjoyed.